Greetings from New York! One of our favorite postcards of the Empire State now available as a tree ornament. 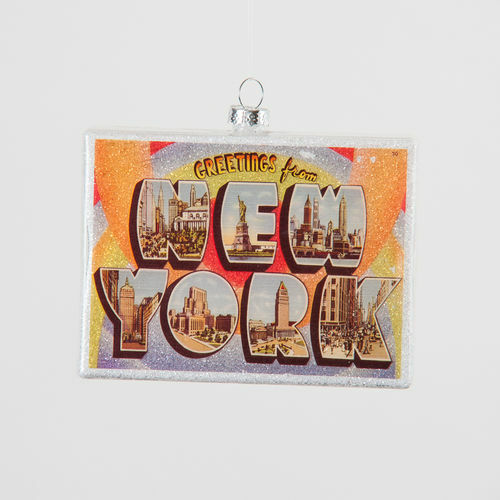 Our fabulous 'Greetings from New York' tree ornament was inspired by the classic 1940s and 1950s New York Greeting Cards with large letters. Like all large letter postcards from that time, there is a small picture set into each of the letters that form the name "New York". The inset pictures show scenes associated with the state including the Statue of Liberty, Battery Park along with the Empire State Building and Central Park. Each ornament is highly detailed and is made in beautiful colors that match the original postcards from yesteryear. Intricately detailed for plenty of personality, each tree ornament is truly one of a kind. Our beautiful ornaments are expertly crafted from mouth-blown glass, then hand painted and given a glittery finish. This beautiful Retro 1950s Style New York Postcard Tree Ornament set will be expertly packaged to ensure safe travels. The perfect gift for New Yorkers, Ex-New Yorkers, Trip-missers and just anyone else that likes New York! Price is for a set of 3 (three) identical ornaments. For a matching look, check our Modern Christmas Tree Ornaments. Dimensions (each on average): 4 3/4" w.